ArtHamptons returns as one of the highlights of the Hamptons summer season. 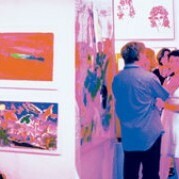 Now in its 3rd successful year, ArtHamptons has established itself as one of the top new art fairs in America. Expect to see a mesmerizing display of post-war and contemporary art, presented by a renowned lineup of international galleries. It?s all assembled in a museum-like setting. There?s important art pieces for every budget and level of art collector.